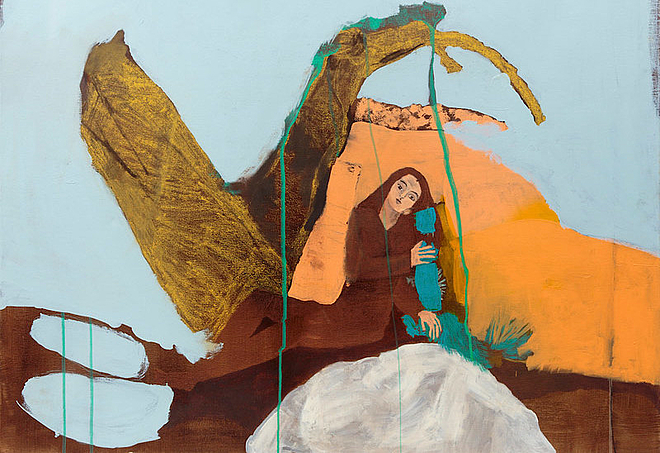 In The pomegranate and the sleeping ghoul, Jumana Emil Abboud engages conceptually and aesthetically with cultural memory and the landscape of Palestine through a series of works inspired by Palestinian folklore featuring imaginary fantastical creatures and enchanted water springs. The Jerusalem-based artist’s delicate drawings and olive-wood sculptures, some of which were specifically made for Darat al Funun, depict ghoulehs and magical beings with the landscapes and sites they inhabit. Presented as a constellation, they encourage us to weave these elements together and create our own narratives. At the heart of the exhibition lies Abboud’s three-channel video installation Maskouneh (Inhabited), made in collaboration with filmmaker Issa Freij and with the support of the Arab Fund for Arts and Culture (AFAC). In search of the haunted springs, caves, and water wells described in 1922 by physician and ethnographer Dr. Tawfiq Canaan, the artists discover a land occupied on several levels, and devoid of tales. Yet what is captured on film is the memory of a landscape that despite its fragmentation cannot be silenced - with every moving tree branch and water ripple it remembers and calls us in enchantment to re-claim our missing limbs. Many of the tales that inspired the works in this exhibition were known to the artist as a child, while others were introduced to her for the first time, such as the tale of The pomegranate and the sleeping ghoul which tells of a man's quest to find the magical pomegranate that would make his wife fertile. By returning to these myths and magical creatures that were once deeply woven within Palestinian identity, and by weaving these stories through our current relationship with the land, Abboud takes us on an exploration into collective memory, the question of loss and fragmentation, and the recurring longing to reunite with the tales and their fields. Statement zum Video Der Taucher, gezeigt in der zentralen internationalen Ausstellung der Biennale Venedig 2009.